Antonio Negri recalls the political experience of various aspects of the mass struggles of the 1970s in Italy, including the Strategy of Tension. Toni Negri was one of the historic leadership of the Italian revolutionary group Potere Operaio (Workers’ Power) and is currently serving a prison sentence in Rebibbia prison, Rome. Negri gave himself up on 1 July 1997 after 14 years’ exile in Paris in a bid to close a chapter in his own personal "judicial history" and that of other far-left militants still in exile. Originally sentenced to 30 years’ imprisonment for "armed insurrection against the state" and to four and a half years for "moral responsibility" for the clashes between revolutionary activists and police in Milan between 1973 and 1977, he theoretically still has over four years to serve. Waiting for a general remission (indulto) from the Italian parliament which has not as yet materialised, he was authorised to work on day-release at the end of July. To speak of what the 1970s represented in Italy’s political history is to speak also of the present. In part, because the consequences of the repressive policies of those years are still very much with us. The Special Laws have not been repealed, at least 200 people are still in prison and about the same number are living their lives in exile(1). Also, because the disintegration of the post-war political system, shattered to pieces by the fall of the Berlin Wall, had reached intolerable limits. But above all, because the social (and psychological) traumas of that decade have still not been healed or distanced. The 1970s are still with us in the sense that they posed for Italy the problem of how to arrive at models of democratic representation in a context in which the social modes of production are being transformed. This is a central problem for advanced capitalist societies and it has still not been resolved. In Italy, the way in which that problem presented itself took a distinctly tragic turn. All the political forces that were involved in this drama were, in the end, defeated. Two writers have done more than anyone else to describe the roots of this tragedy: Leonardo Sciascia (2) and Rossana Rossanda (3). Sciascia was an able chronicler of events and revealed to the world the labyrinthine inner workings of the crisis; Rossanda, maintaining her political commitment throughout, reported every day on the desperate powerlessness of the protagonists to reach any kind of solution. In Italy, the 1970s actually began in 1967-68 and ended in 1983. In 1967-68, as in all the developed countries, the student movement took to the barricades. However, the breadth and impact of this part of the movement was not as extensive as in other European countries: in Italy, the student May 1968 was not a particularly significant moment. But the same cannot be said of the broader picture: in effect, the movement opened a breach in the system of power, and into this breach was swallowed, in successive waves, the social movement that developed in protest against a system which was increasingly falling behind in modernising capitalism, and was repressing the democratic potential inherited from the anti-fascist struggle and the Resistance. What happened then was that, after the students, other social protagonists emerged to make their mark on the political scene. For example, 1969 was the year of the factory working class, with new Factory Councils (consigli di fabbrica) emerging, an egalitarian movement fighting for equal wage rises for all, and a deregulation of capitalist policy towards the labour market. This phase of struggle was crowned by the achievement of the statuto dei lavoratori ("workers’ statute"). Immediately after this, came the legalisation of divorce, the implementation of regional decentralisation, the recognition of conscientious objection and large numbers of legislative innovations which "unfroze" the old post-war society. In other words, there were a variety of institutional responses to the continuous unfolding of struggles - not only of students or factory workers - that had been opened by 1968. In around 1973-74, the framework began to change. Up till that point, the relationship between the social movements and the "left" as a totality had, despite passing difficulties, been essentially dialectical. After the oil crisis of 1973 and the first capitalist counter-offensives, things changed. The Italian parliamentary left broke off dialogue with the new social forces, and the majority component of that left, the Italian Communist Party (PCI), proposed a "historic compromise" (compromesso storico) with its long-time adversaries, the Christian Democrats (DC). Now, it is worth remembering that the Italian political system of that time was characterised, for reasons related to Italy’s position within the cold war scenario (4), as an "imperfect two-party system" (bipartitismo imperfetto). In other words, in the normal run of parliamentary life, there was a convention that the PCI was to be excluded: whatever gains it may have made in electoral terms, the party of Enrico Berlinguer (5) was excluded from power, and that power was conceived as remaining in the hands of the Christian Democracy, ostensibly a bastion of Western values. However, despite this institutional constraint, the DC and the PCI had contrived to create a system of power which made possible a degree of equilibrium, and which offered a chance of moderating social conflicts when they broke out. Thus, alongside this "imperfect two-party system" we had what was called at the time an "imperfect co-associationism" (coassociativismo imperfetto). At the start of the 1970s, building on the base of a growing electoral power which it was acquiring from the development of these social movements, the PCI decided that it was time for it to play a bigger role in the parliamentary majority. From now on, it presented itself not merely as a "party of struggle", but as a "party of struggle and government". From 1973-74 onwards, parliament appeared to be operating on this basis with a degree of unanimity. In 1978 the PCI went so far as to offer active support to the new government. And in so doing, it was to step down from the last remaining controlling functions which were assigned to it under the "imperfect two-party system", as the political representative of the opposition. The "co-associationism" became "perfect". The four years from 1974 to 1978 saw a progressive tightening of the alliance between the DC and the PCI: this alliance extended outwards from government and parliament to the whole system of power, from the central administration out to the periphery, to the trade unions, to the running of communications and the media and even, remarkably, to the police. However, at the same time Italy’s broadly-based social struggles were becoming more intense and the social movements broke definitively with all forms of institutional representation. We should not forget that these were battles of enormous extent and massive intensity. Beyond the simple exercise of that "counter-power" which they had embodied since 1968, the social movements were also nurtured by the consequences of Italy’s monetary deflation policies and by the industrial restructuring through which an initial - but definitive - "emergence from Fordism" was taking place, in terms of Italy’s systems of manufacture and production. As it happened, the "historic compromise" was built around precisely these "austerity policies" against which the social protest movements were being organised. Thus, when the repression - repression by the employers in the factories and repression by the police in society as a whole, making use of a whole new range of laws - stepped over the line and went beyond the bounds of democracy, the resistance in turn began to arm itself. The Red Brigades, for instance, initially emerged from among workers in the large factories in the north, which had been subjected to savage restructuring (6); and it was in these same factories, or in the communities associated with them, that practices of "proletarian justice", sometimes at the mass level and sometimes clandestine, began to appear. A further independent and over-determined variable should be added to this interweaving of social and political components, which from this point onwards was continuously being crossed and recrossed by an uninterrupted series of working-class struggles and manifestations of urban violence. This new element was the direct provocation - for which I would argue that the only appropriate term is "terrorism" - on the part of the state organs charged with maintaining NATO interests before, during and after the "historic compromise". After the Milan bombing of 1969, terrorist operations by these state apparatuses continued, year after year, and included the bombing of demonstrations and public meetings, and the bombing of trains and stations, which culminated in the appalling Bologna bombing in 1980 (7). (To date not one of the perpetrators or organisers of these massacres has been imprisoned). Criminal actions of this kind obviously added fuel to the fires of a Resistance which was only fighting for the right to self-expression, and had the means to do so. In 1977, the movement experienced a major flare-up in Bologna, a city which was a showcase for the Communist Party’s municipal policies. At the end of a demonstration, yet another left-wing militant was killed by the police. Rioting broke out. The communist mayor and the "historic compromise" government sent armoured cars to sweep away the barricades. In that same period, the national secretary of the communist trade union (CGIL) was chased off the campus of the University of Rome, after violent clashes, by a mass student movement which by then had extended to include the urban proletariat. In Milan, Turin, Naples and Padova, there were huge marches during which, more and more frequently, armed extremist groupings began to appear. They let it be known that they saw themselves as valid components of the movement. Among the working class and the urban proletarian movements, the resistance against restructuring was growing irresistibly, within a climate of massive resentment towards what people saw as betrayal by the official left. By this time, Italy was virtually in a state of civil war. None of the actors was any longer in control and this was a tragedy that was to end in defeat. For everybody. The first to be defeated were the social movements. Having cut themselves off totally from the representatives of the traditional left, which proved incapable of either providing adequate political forms for the expression of counter-power or of controlling it, the social movements were thus dragged into the abyss of an extremism that was becoming increasingly blind and violent. The kidnapping and killing of Aldo Moro (8) was the beginning of the end for a movement which, in advancing its military objectives, had lost the ability to assess the political consequences of its actions. Caught in the grip of this crisis, the political process which had created a substantial social stratum of hundreds of thousands of activists and militants was soon to be dissolved by a massive and powerful repression. The political forces which embodied the "historic compromise" were also searching for a way out of the social isolation in which they now found themselves, but they did it by opting for policies of repression pure and simple. They won, but it turned out to be a Pyrrhic victory. We had the introduction of special police, special prisons, special courts and trials, and special emergency measures imposed by the government: what was effectively a state of emergency ended by reshaping - and adding to the isolation of - the constitutional structure of a political system that had already been butchered by the previous realities of "imperfect bipartitism". All this had dramatic consquences. The first to suffer was the PCI. In the years that followed, it came to be at the mercy of the right and experienced a continuous decline in its electoral support. At the same time, it failed to re-establish any kind of contact with the social movements, which by then had become politically marginalised. The Communist Party was to become something which in its original glorious history it had never previously been: a bureaucratic grouping, cut off from society and locked into the machinery of power. The Christian Democrat party, for its part, lost its central constitutional position during the course of these developments. It became inward-looking, concentrating on maintaining its local power bases, and it was no longer capable of providing the means for an understanding of the social and productive landscape from within which the crisis had been created. It fell to the (socialist) government of Bettino Craxi, which came to power in 1983, to transform the isolation of the political classes into a massive machinery of corruption and degradation of society and the state. The 1970s had come to an end. It is worth asking whether the 1970s could have created a different outcome in the political situation and within the political system of the time. The answer is yes, but only on one condition: if there had been at that moment a mode of political representation capable of absorbing the consequences of the very profound social transformations that the movements were imposing. No such thing existed at the time and subsequently the problem was not posed. Since the fall of the Berlin Wall and the radical restructuring of the framework of Italy’s parliamentary and political life, the only impulses towards constitutional change that have emerged in Italy (which, incidentally, have proved to be unrealisable, as is confirmed by the constitutional reform project outlined by the Bicameral Commission (9)) have focused on the upper echelons (on changes in the presidential system) and, consequently, on the setting-up of increasingly efficient and centralised instruments of pre-emption, mediation and repression. There have been no proposals for new forms of political representation or new channels for substantive democracy. As for the activity of the government, given the present realities of the Second Republic, it has been concerned essentially with neutralising social conflict and ensuring the compatibility of Italy’s system with the "world market". The defeat of the movement of the 1970s - a defeat which was both political (as in other European countries) and also military - has not even remotely opened the way for a democratic renewal. It is appropriate for those who were involved in those movements (10) to bemoan their own tactical naivety and despair of their strategic illusions, but they nevertheless have the right to observe that the problem that we represented still exists. Today, more than ever, Italy needs to rediscover the democratic values that we were experimenting with in those years. *Author of Revolution Retrieved, Red Notes, London 1979; The Politics of Subversion, Polity Press, Cambridge, 1989; and The Savage Anomaly, University of Minnesota Press, Minneapolis, 1991. While in France, Toni Negri lectured at the Ecole normale supérieure in rue d’Ulm, and taught at the University of Paris-VIII and the International College of Philosophy. (1) See Anne Schimel "Justice de plombe en Italie", Le Monde diplomatique, April 1998. (2) The writer, chronicler and journalist Leonardo Sciascia (1921-89) observed Italian society, writing from his native Sicily; his works include The Day of the Owl, To Each His Own and The Night and Death, all published by Carcanet, London. (3) Together with Luigi Pintor, Rossana Rossanda was the founder of the Rome-based daily Il Manifesto, of which she is still the editor today. (4) See François Vitrani, "L’Italie, un Etat de ’souvraneté limité’? ", Le Monde diplomatique, December 1990. (5) Enrico Berlinguer followed Palmiro Togliatti and Luigi Longo to become the third general secretary of the PCI in the post-war period. After General Pinochet’s coup d’état in Chile, he put forward the notion of the "historic compromise" (1973) and, within Europe, created a "Eurocommunist" line that countered that of Moscow. (6) The Brigate Rosse (Red Brigades) were, like Prima Linea (Front Line, 1976-80), armed organisations of the far left. 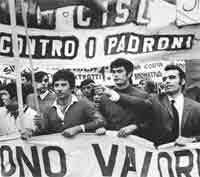 Operating at a more general political level were organisations such as Lotta Continua (Fight On, 1969-76), Potere Operaio (Workers’ Power, 1969-73), Autonomia Operaia (Workers’ Autonomy) etc. (7) The explosion of a bomb at the Agricultural Bank in Piazza Fontana, Milan, on 12 December 1969 (with 16 dead and 98 wounded) marked the start of the "strategy of tension" which was to culminate in the bombing of Bologna Central Station on 2 August 1980 (85 dead and 200 wounded). In both these cases, as the legal authorities subsequently confirmed, the authors of this blind terrorism were the far right. According to statistics from the Italian ministry of interior, 67.55% of violence ("affrays, guerrilla actions and destruction of property") committed in Italy between 1969 and 1980 were attributable to the far right, 26.5% to the far left, and 5.95% to others. (8) At the moment of his kidnapping on 16 March 1978, Aldo Moro, the president of the Christian Democrat Party, was negotiating with Enrico Berlinguer on possible ways of bringing the PCI more fully into government. (9) The aim of the Bicameral Commission, under the presidency of Massimo D’Alema, the head of the Party of Left Democracy (ex-PCI), was to open negotiations for a constitutional reform project which would lead, among other things, to universal suffrage elections for the presidency of the republic and changes in Italy’s electoral system. Its work was terminated in May 1998 after a U-turn by Forza Italia’s Silvio Berlusconi, who at one time had endorsed the project.